Have students try these activities to expand their interest and knowledge about the history of the Civil Rights movement. 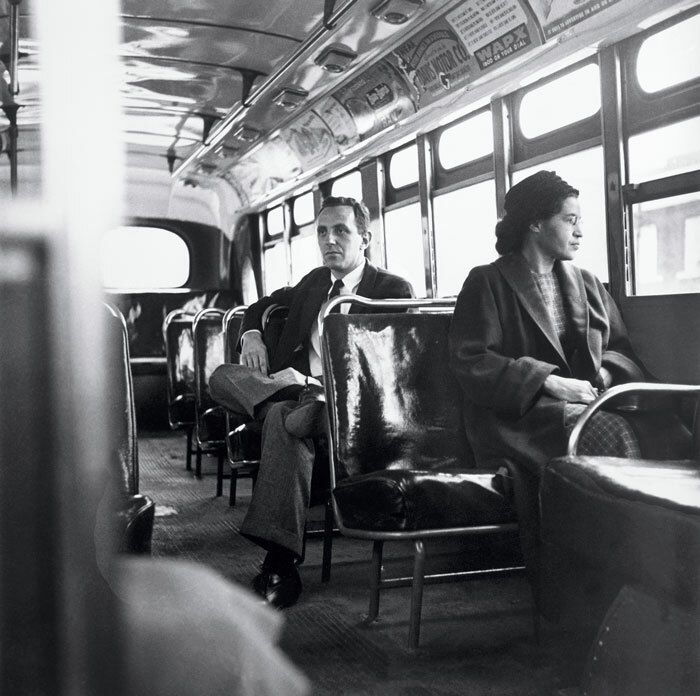 Rosa Park died in the fall of 2005, 50 years after she refused to give up her bus seat in Montgomery, Alabama. Suggest that students do research about Rosa Parks and her arrest in Montgomery. Ask them to also find out what happened to the bus. They can share their findings with the class. Have students draw a map of the United States that show sites important to the civil rights movement. Students should label the place names on the map and provide a summary of each place’s importance in captions around the map. Have students prepare a time line of events that led to the civil rights movement of the mid- 1900s. They might begin their time line with the colonial period when Africans were first brought to the Americas. They can extend their time lines to today and the continuing work of organizations such as the NAACP and Operation Push. Have students look at the lyrics of “We Shall Overcome” in the topic Defining Civil Rights. Help them find recordings or lyrics and music for this and other songs used during the civil rights movement. Students can prepare for a concert in which they provide background information about songs and then sing them. Some students might enjoy going beyond protest music to do research on the African American contribution to American music. They could prepare an audio presentation that samples the rich and diverse music created and performed by African Americans. Jacob Lawrence was an African American artist who depicted the history of the African American people in his artwork. He did series of paintings on famous African Americans including Frederick Douglass and African American experiences such as the Migration. He painted the everyday lives of people as well. Ask students research reproductions of some of Lawrence’s work. Have them share their findings with the class and discuss the view of African American experiences Lawrence’s artwork provides. Listen to a recording of the “I Have a Dream” speech that Martin Luther King, Jr., gave on August 28, 1963. Then ask students to prepare a choral reading or recitation of the speech for a presentation to the class. In 2004, the nation acknowledged the fiftieth anniversary of the Brown v. Board of Education decision. Have students research information about the case and the case it overturned. Encourage students to work with partners to prepare a brief written report about the case and its impact on the civil rights movement.